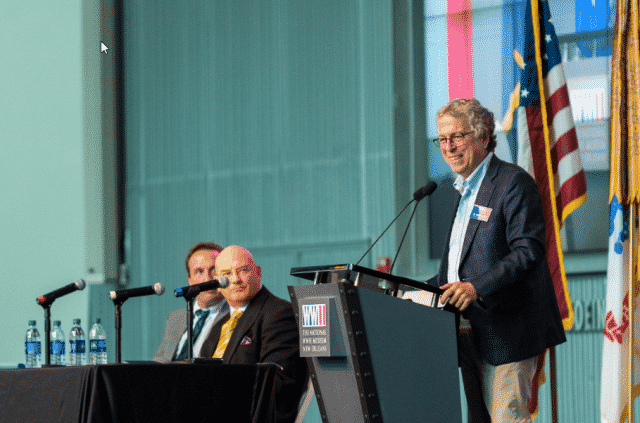 What: The National WWII Museum in New Orleans hosted its premier educational gathering of writers, scholars and enthusiasts this past weekend for three days of talks, panels and social events centered on the war that changed the world. 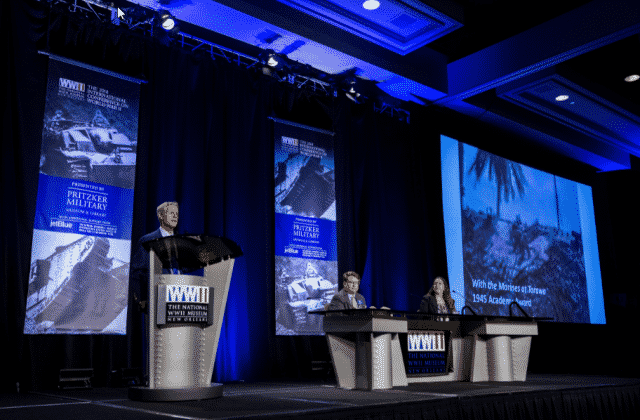 This year’s International Conference on World War II featured a pre-conference symposium exploring the legacies, leadership lessons and tactics of World War I and how it affected World War II. Topics discussed, included Operation Market-Garden, the battles of Peleliu, the Huertgen Forest, underappreciated WWII campaigns and a special presentation on the Normandy landings from Museum President & CEO Emeritus Gordon H. “Nick” Mueller, PhD. 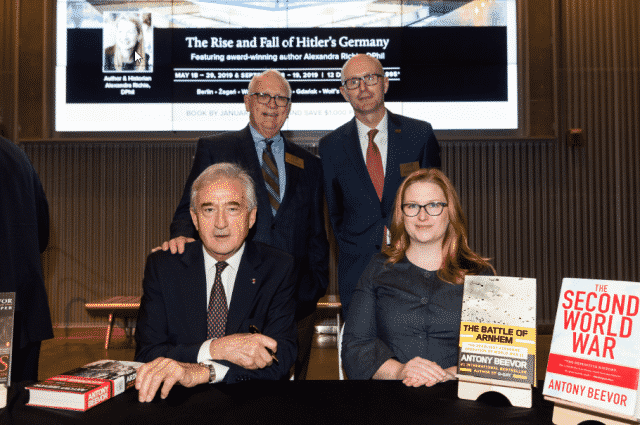 Standing (L-R): Gordon H. “Nick” Mueller, PhD, Museum President & CEO Emeritus and Stephen J. Watson, Museum President & CEO; Sitting: Sir Antony Beevor and Megan Williams, Pritzker Military Museum & Library. Attendees received exclusive access to the Museum and were invited to an evening reception during which the institution’s galleries were available for touring, followed by a closing banquet dinner and a keynote address from New York Times best-selling author Andrew Roberts on his new book about Winston Churchill. Who: More than 500 authors, historians and history buffs attended the event, and more than 30 distinguished scholars spoke at the conference, including prominent historians and best-selling WWII authors Rick Atkinson, Sir Antony Beevor, James Holland, Keith Lowe, Margaret MacMillan and Robert Citino, along with Museum members and event patrons. 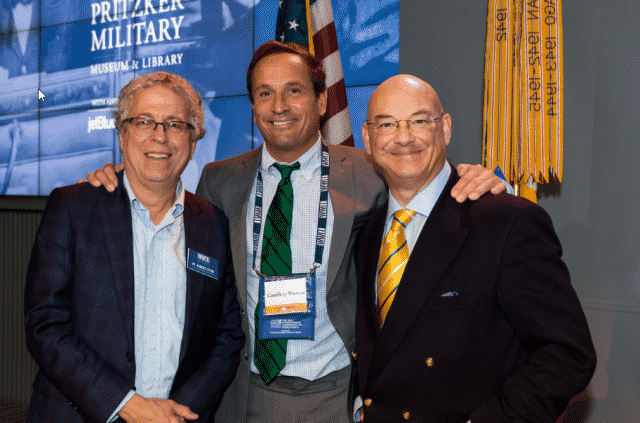 Why: The annual conference brings together a community of history buffs, WWII authors, and prominent historians to explore and discuss the war that changed the world. The National WWII Museum tells the story of the American experience in the war that changed the world – why it was fought, how it was won, and what it means today – so that future generations will know the price of freedom and be inspired by what they learn. 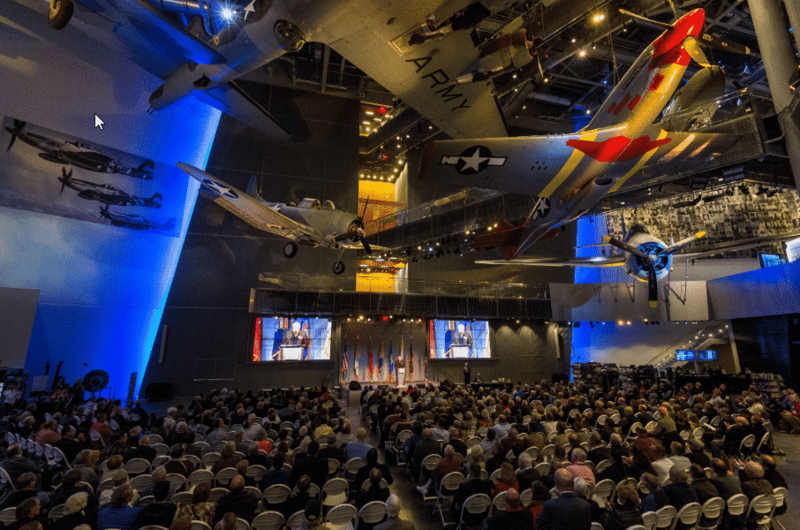 Dedicated in 2000 as The National D-Day Museum and now designated by Congress as America’s National WWII Museum, it celebrates the American spirit, the teamwork, optimism, courage and sacrifices of the men and women who fought on the battlefront and served on the Home Front. The 2018 TripAdvisor Travelers’ Choice™ awards ranks the Museum No. 3 in the nation and No.8 in the world. For more information, call 877-813-3329 or 504-528-1944 or visit nationalww2museum.org.